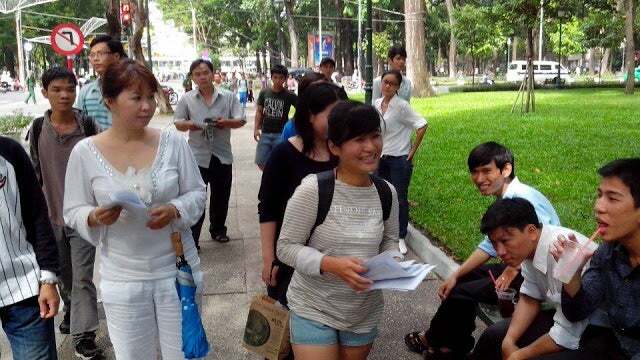 Rights activist Nguyen Hoang Vi distributing Universal Declaration of Human Rights to people on May 5 at April 30 park. Vietnam’s strategy of repressing critics big and small will only lead the country deeper into crisis. The latest arrests and assaults on bloggers show how afraid the government is of open discussion on democracy and human rights. (New York, June 20, 2013) – The Vietnamesegovernment should unconditionally release recently arrested bloggers and end physical attacks on critics, Human Rights Watch said today. Vietnam’s donors and trading partners should publicly call on the government to end the use of the criminal law against peaceful activists. On June 7, 2013, five men believed to be police officers assaulted 26-year-old blogger Nguyen Hoang Vi (also known as An Do Nguyen) and legal activist Pham Le Vuong Cac on a Ho Chi Minh City street. According to Vietnamese bloggers, the attackers had been monitoring Nguyen Hoang Vi and her family for several days and beat her into unconsciousness, leaving wounds requiring hospital treatment. Nguyen Hoang Vi is a prominent Internet personality who was also attacked on May 5-6, 2013, after playing a leading role in an attempted “human rights picnic” in Ho Chi Minh City. On June 13, police arrested 61-year-old blogger Pham Viet Dao at his Hanoi home, also for “abusing democratic freedoms,” according to an announcement by the Ministry of Public Security, thus signalling his likely prosecution under article 258. His website, like that of Truong Duy Nhat, had been critical of a number of Vietnamese political leaders. On June 15, Dinh Nhat Uy was arrested pursuant to article 258. His younger brother,Dinh Nguyen Kha, had been sentenced to eight years in prison on May 16, 2013, for distributing leaflets critical of state foreign and domestic policies. Dinh Nhat Uy, 30, was arrested in Long An province after launching an Internet campaign calling for his brother’s release and posting pictures and notes on his Facebook account. He was accused of “distorting the truth and badly influencing the prestige of state organizations,” as the official news Agency VNA put it. Article 258 is used to prosecute those whom the government maintains “abuse the rights to freedom of speech, freedom of press, freedom of belief, religion, assembly, association and other democratic freedoms to infringe upon the interests of the State, the legitimate rights and interests of organizations and/or citizens,” and provides for up to seven years’ imprisonment for those who commit this supposed offense “in serious circumstances.” Vietnam’s politically controlled courts routinely apply such provisions to imprison people for peaceful expression. The government is increasingly cracking down on criticism of corruption and authoritarianism, Human Rights Watch said. Those recently targeted represent a spectrum of public opinion, as Truong Duy Nhat, Pham Viet Dao, and Nguyen Chi Duc formerly worked for the ruling authorities, Truong Duy Nhat worked in the official media, Pham Viet Dao was a government official, and Nguyen Chi Duc was a member of the Communist Party. Dinh Nhat Uy, Nguyen Hoang Vi, and Pham Le Vuong Cac reflect dissent among those in the younger generation without such ties. Previous #India- Medical student sexually assaulted by four men at Manipal #Vaw Next What’s going on at Kudankulam?